Walt Disney was the first to teach me about death. I’m a big fan of Disney films. I probably should have grown out of them by now, but alas, I haven’t. So it happened again. I was babysitting my three year old cousin watching “The Princess and the Frog” when this little fire fly in the movie died. The next scene was his funeral, with all of his family and the two little frogs carrying his little dead bug body down this stream to send him off. All of a sudden it hit me. I’m watching a Disney film and here is a death scene. It’s introducing the fact to children that death is a part of life. Bingo. I knew I had this obsession for a reason. Think about it. In all of the princess movies, how often are there both parents? I can only think of one, Sleeping Beauty, and even in that she’s separated from them for the majority of the time. Beauty and the Beast, who knows what ever happened to Belle’s mother and her father comes close to the end in a scene or two. Aladdin, he is an orphan and Jasmine only has her dad. The Little Mermaid, although, she’s half fish so maybe mermaids didn’t need a female to reproduce. I’m not really sure how that works, but still, only daddy is present. Cinderella, her father passes away in the beginning leaving her with that horrible excuse for a step mother. How about the Disney movies that show a death situation? The Lion King. Goodness, I can’t even watch the stampede scene without bawling. Most of the time I just fast forward it. Bambi makes kids never want to become hunters. The Fox and the Hound, same situation. I mean the list really goes on and on. So what’s up Walt? Did you have some parenting issues when you were a young lad or did you feel that by leaving out a parent or two you were evoking some sympathy for your characters? Maybe you just realized that death is as much a part of life as following your dreams and you wanted to introduce the concept to kids in a way they could grasp it. I mean, have you ever seen “UP”? Besides for the fact that it shows a miscarriage in the first ten minutes, watch a little more and you’re face to face with Ellie’s death. Seriously. Look me in the eyes and tell me you didn’t cry. Carl and Ellie met when they were kids just playing around. In a matter of the four minutes it took you to watch that little clip, you saw them fall in love, get married, face hardships, make tough times work, have fun and in the end, watch Ellie pass away. Isn’t that the perfect to explain life? Things won’t always be easy, it won’t always be sunny, but if you love others, work hard, and keep moving forward, everything will be okay. And when someone you love passes away, it’s okay to be sad as well. But one door will always be open. You may not be expecting that little chunky boy at your doorstep, but he just may be the best thing to come into your life at a time when you need it the most. So thanks Walt. Thank you so much, for recognizing the fact that we are on this earth for only a finite amount of time. Work hard, do what you want to do, don’t be afraid to create and explore, love with all your heart, have fun, but still be aware of life’s frailty. That’s a wonderful lesson to give to kids when they’re still young enough to be influenced. Heck, that’s a wonderful lesson to give to parents when they’ve forgotten it. And who knows. Maybe the next Disney film to come out will incorporate a funeral director in it somehow. We’re not scary people you know. And if anyone from Disney wants to bounce ideas back and force I’m always up for it. “The Princess and the Funeral Director”. I think it sounds like a hit. I liked this a lot Lauren. 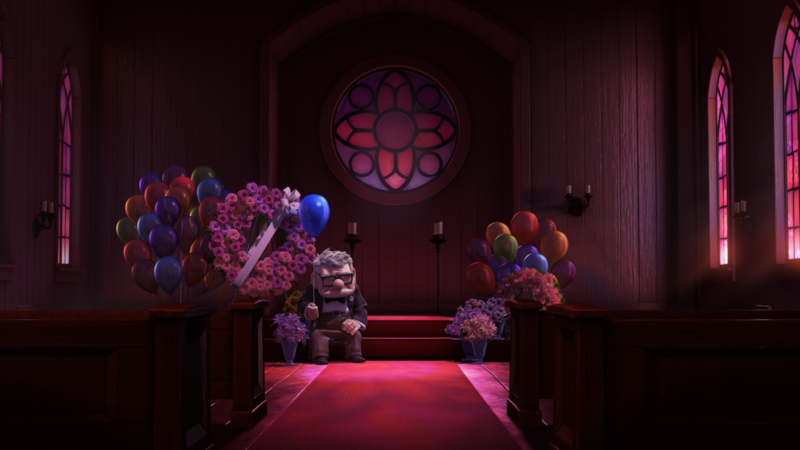 While Walt Disney was obviously not responsible for Up (give Pixar it’s due credit), it’s fortunate that he didn’t skirt around the subject of death like he so easily could have done. I think that it says even more that although all of his films were animated, the content present in them isn’t JUST for children. This is stuff we all need to know. All in all, good post! First, thank you for giving credit where credit is due! I realize that most of the time I write solely to say what I want to say and get my point across while leaving some credit out. Its a bad habit for writers and insulting for others involved. Alas, I’m no writer and have no journalism background and often need the reminder. Secondly, thank you very much John, it means a lot to me! Lauren – what an excellent point! I love it! I hope you are doing well! Thanks Theresa, I am! I hope you and everyone are doing well also! Doing the job you do gives you such an interesting perspective on everything. I really like that. Have you thought about actually writing a book on your experiences and insights?? I think that would be awesome! I love that your job gives you such an interesting perspective to things. Have you ever thought about writing a book with all your experiences and insights?? I think that would be awesome! Thanks Katie! I’ve thought about maybe writing a book. Who knows! If people really enjoy my view on things it could be a fun project to work on! Nice, nice, nice! I spread the word, via Facebook, and subscribed to your blog. I’m one happy woman! Love this! I am a minister dealing with 2 kids, 12 and 8 who just lost their mom to breast cancer. I may recommend UP to the father in a month or two. It might do him good to cry and laugh….SQUIRREL! That was one of the greatest love stories ever told, and it should be remembered as such. Also, Walt’s been dead for a long time, sorry. I lost my father when I was 15, so death has been on me a lot the past 20 years. I’m around 35 and I’m very aware my life is approaching 50% over. Up! makes me think a lot about my darling wife – my Ellie. I don’t know what I’d do if I lost her like Carl or my mom did their spouses. I guess it teaches us to express our love for them now and to enjoy every moment.